By Srinivas Chowdary Sunkara // petrobazaar // 6th April, 2019. Fuel oil prices shrank in Singapore market during this week. Both IFO 180 cSt and 380 cSt graded fuel oil prices closed the week lower by $5 or 1.06% to $455.5 and $423.5 respectively. MGO prices are slipped by $4 at $601.5 in this week. On the other hand global crude benchmark prices ended the week higher after touching year's high post Nov, 2018 levels. Supply tightening talk and expected demand growth are the factors driving the crude oil prices up. Turning to Heavy oil market, IMO 2020 is likely to be the most impact ful refined product specification change ever. It will impact prices markedly for crude oil and refined products as well beyond just marine fuel. 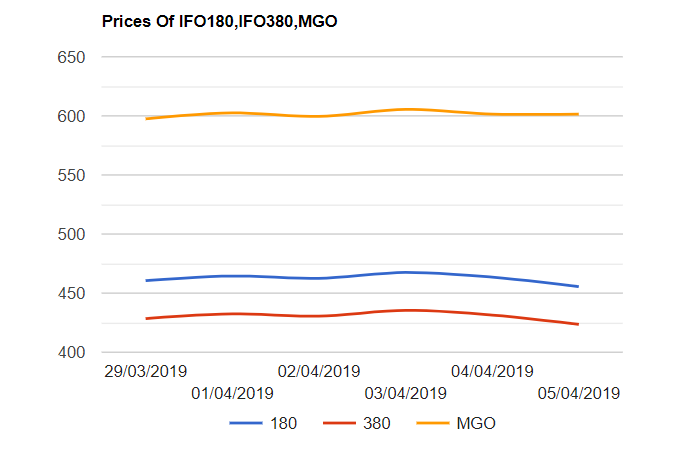 The roll out of IMO 2020 is quite likely going to be a bumpy ride from the key price differentials perspective.